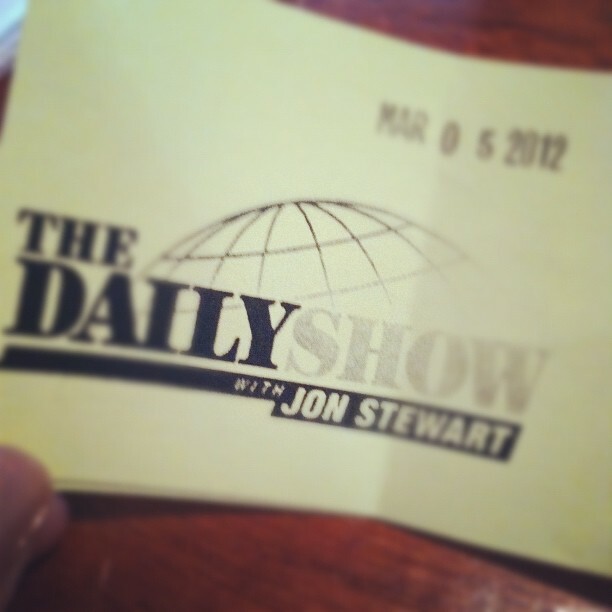 Last night, I had the very exciting privileged of being in the Daily Show’s live studio audience. I have already been in the audience for the Colbert Report, and this was a very different experience. Sarah and I arrived just before 2:30pm so that we could grab our tickets. One perk the Daily Show has over the Colbert Report, is that after we got our “line placeholder,” we could leave and did not have to come back until 4:30, right before they would let us in to begin the taping. So, after much less standing in line, we were ushered into the studios around 5pm. Sadly, all pictures were banned once we entered the studio, but it was surprisingly small. The stage and audience were a good size, but the desk and set seemed miniature in a way. Like at Colbert, there was a warm up comedian, and Jon came out early to answer audience questions. The best was, “what would be your idea news day?” His answer was along the lines of “a unicorn attack. A unicorn with a knife.” Stewart is, like all the reports say, quite small. It was hard to tell since everything seemed out of proportion, but he was small. The episode was fantastic. If you have not already seen Monday night’s broadcast, I suggest you drop everything and watch it. It was a different crowd and atmosphere then Colbert, who seemed more goofy and fun. But Jon Stewart is just straight up brilliant and hilarious. So if you are a big fan and have an afternoon/evening to kill in the city, absolutely look into getting tickets. You can check out the awesome opening here!